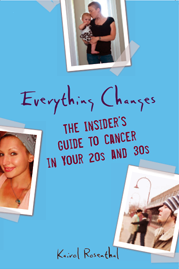 Everything Changes – The Guide to Young Adult Cancer » Hiding Cancer from Your Parents? Hiding Cancer from Your Parents? I know from writing my book, Everything Changes, that Kim is not alone. I’ve met and written about other people who chose to not tell their parents about cancer and other serious medical conditions, or who denied their parents’ help and presence during treatment. There are rare circumstances where it may be a smart choice to wait to tell your parents. If your parent is irrational, you have an extremely stressful relationship, or they have a mental illness that prevents them from being helpful, empathetic, or supportive, going through cancer care without your parents and with an organized set of stable, supportive friends might be the best choice for you. Kim, I don’t know that there is a right way to tell your parents, but here are a few things that come to mind that could be helpful: Do it in person if possible; Don’t do it in public; Ask a stable family member (a cousin or aunt) to be present with you (or if you have to do it over the phone ask them to call your parents after you’ve spoken with them); Bring or send simple, written information to back up good, rehearsed definitions about your disease, your treatment path, and how it impacts your daily life; Think about how to answer when they ask “Why didn’t you tell me?” If it’s a good time to dive into the root of your relationship problems, then prepare for how to have that conversation. Otherwise, prepare strong statements about how and why not telling was the most supportive thing for you. And acknowledge that you understand why they might feel hurt by your choices; Alert your friends about the conversation so they are there afterwords to give you the love and support you deserve. I’m curious what words of advice or support other people have for Kim. Have any of you hidden your cancer from your parents or waited a long time to tell them? Read more about how other young adult cancer patients handled relationships with their parents in Everything Changes: The Insider’s Guide to Cancer in Your 20s and 30s. yes! i’ve been hiding my cancer from my parents through multiple surgeries now & i have no intention of telling them any time soon/ever. i really support kim’s decision — i believe in doing whatever it is that you need to stay alive & if that’s retaining your privacy & autonomy, even at the price of deception, i condone it wholeheartedly. i also just want to point out that there’s such a hierarchy at work when it comes to the folks who surround us & build us up through crisis & trauma. my chosen family, my community — those are the folks that have shown me what it really means to Show Up for someone, not my biological family. I come at this issue as daughter whose mother told her last about her breast cancer diagnosis. I was hurt, angry and I was scared for her and for me. I was a caregiver when she needed one and I supported her treatment decisions, even if I didn’t agree with them. I wish my mom had told me earler, but I was training for a half marathon, so mom waited. When mom finally did tell me, I felt betrayed because she hadn’t told me sooner and she had told the rest of the family. Sure our relationship wasn’t the greatest either but I was justifiably angry. This is my take on the situation. You may or may not want to tell your parents and that’s your choice. It is your life and I wish you love and support that this message board and others like it can give you. This can be a difficult decision to make. I did tell my family, I was in the hospital so I had no choice, but I was floored by their strange reaction. I found myself comforting others much more often than I received comfort. I was asked a million questions, stared and and found myself dealing with so many awkward situations I couldn’t even begin to count them. I think the only advice I could give to you on this one is to tell your family its not about them as much as it is about you, what you were ready for and what made you most comfortable. This is a very scary and difficult time and they need to be understanding that you are dealing with this the best way you can. I’m so sorry you are having to go through this and you will be in my thoughts! Depending on what relationship you have with your parents, I think it’s always best to keep family involved. They will no doubt feel hurt that you didn’t tell them, but I can understand a person keeping it from their folks if for example they are abusive or mentally ill.
Whatever you do try not to get too upset. They may even get angry, but stay calm and explain that you’re as scared as they are and what you need right now is their support. I think at some point, the secret will have to come out, but I’m making no plans to spill the beans soon. Though, my parents are coming to town to visit me on April 12, so I am a bit afraid if I can’t adequately cover my scar with clothing, they might find out inadvertantly. So I’m bracing myself in case that happens! Any other comments or thoughts, I’d be happy to hear them! I come from a somewhat different side of this. My parents knew when I was 1st diagnosed 8 years ago, but really didn’t want to hear anything about it. I have no clue if they know about subsequent relapses and treatments and don’t care to find out. I think it’s really about what works for you. Do you have the support that you need? Are you happy with the way things are? If not, change it. I know that’s easier said than done, but it’s definitely possible and worth whatever effort it takes to get to the point where you’re feeling good (or at least mostly so) about how things go. I am lucky to have a very supportive family, and people to help me. I was diagnosed one week after having a baby, and heaven knows I would not be here now if I didn’t have them. That being said, I have met many people who do not have these types of families. I have a sister in law who’s mother is a total nut-case. Total. And if she had cancer it would be us taking care of her – if she tried to involve her mom, her mom would make it into a melodrama staring- guess who – that’s right – mom. Not only that, but she believes in only holistic medicine, so if her daughter wanted to find help from traditional medicine, it would be an all out war. Luckily her mom is not interested in her older children (of which she has 13) and would be perfectly oblivious unless someone told her. She could probably show up with a gaping scar with steri strips still on and the mom wouldn’t bat an eye. It sounds like Kim’s family is not quite this extreme, but she needed her space and time to deal with her cancer on her own. I think that is fine. Everyone has to get through what they have to get through the best way for them. If you have a support system, use them. Ask someone to be with you when you tell your parents (if you choose to) – they may notice the scar or if it comes back you might have to break down and tell them. I go to a cancer support group and I know my mediator would be happy to be there (or any of the other wonderful ladies) to help me get through this. Also, try to understand that they might be hurt, and that is ok. Everyone’s feelings are justified and matter. It is what we do with them that counts. This is in no way a comparison to cancer, but I got married – eloped, and didn’t tell my family for 3 months. I had only known the guy for 3 months, they didn’t know him, and I wanted him to meet them. It somehow just got away from us and when we could finally tell them in person I was (surprise!) pregnant too. They were sad they didn’t come to their own daughter’s wedding. They were hurt I didn’t call them after the wedding, but they are supportive and love my husband like a son. I think you will find that most families can get past anything if they try. Good luck, Kim, whether you tell them or not! I have a similar story. I have not told my parents about my own dx. Mainly because of the stigma of cervical cancer, and I don’t want them to think badly of me. I also didn’t want to have to be there for them, when I could barely be there for myself, if that makes sense….you know? Kim, if you are ever interested in contacting me, I would be happy to talk. You can contact Kairol to get in touch with me. I’m glad to have heard all of your stories, as painful as many of them sound. In my book, I interviewed a Native American woman who did not tell her parents because in her culture it is taboo to talk about illness. After a few years, her parents found out. She eventually became an outspoken cancer advocate in the Native American community, finding a way to respectfully merge tradition with the need for cancer education and action. I think too often when we talk about cancer and communication (between our parents or our doctors) we think of it from a very white-American perspective. There are a ton of cultures in our country that handle illness so differently. Maybe this should be the topic for another blog post! Still, I am curious if in regards to this topic of hiding cancer from parents, do inter-cultural issues play a part for anyone? I think the cultural thing is part, but not all, of it in my own case. One of my best friends was also Taiwanese-American, but unlike me, she had a very close and ‘normal’ relationship with her parents. During the (too short) time that she battled metastatic liver cancer, her nuclear family was her main support system, and she actually didn’t let even her closest friends come visit her. (I still miss her so much, esp since I was diagnosed myself with cancer.) My own case is the opposite – I have let all my closest friends know, but not my own parents and cousins/aunt/uncle. I also have another Malaysian friend battling metastatic esophageal cancer right now, who seems to have a great support system through his nuclear family and (now) wife. That being said, at least for my own parents and esp mom, I think she is over-protective of her kids in general, and that is kind of a theme among Asian parents, I believe. That translates in her case, to being overly worried etc. when any of her children have even minor illnesses like colds, cavities, etc. She has made comments that do make me feel like in her mind, she would think Cancer is like the ultimate curse, and there must be some superstitious reason(s) why it would happen. I do not look forward to finding out her theories. Kim, if your folks notice your scar and you do not want to share the cancer part of the story, you can share WHATEVER PART of the story you want to or you can make some of it up. It’s only their business if you want to share with them…. Surgery. You can say you had a cut if you want. You can make whatever up you want to. But have something prepared so that you have an answer ready. For a long time I never knew what to say if someone invited me to do something and I wanted to decline, gracefully. That’s whenn I learned- – Oh I wish I could join you, but I am busy that night, will be out of town then, etc. What a relief a pat answer can be. It sounds like you are drawing the boundaries you need to draw with your family at this moment. It may or may not change over time. My crazy Jewish family can often remind me of a Bernad Malamud novel. Yours reminds me of Amy Tan…you read her? My reply is a little late, however I was just shown this page by a friend. I told my parents right away. They were all concerned and watched me battle my thyroid problem for years. My mother is great; she gives me space if I need it and watched my baby often when I was recovering from the surgery. However my dad was another story. He lost his best friend to cancer a few years ago. Him, my friends, and other family… I feel like I am the one who has to comfort them instead of them comforting me. I really hate having to tell them over and over, “No, everything is okay! Don’t worry!”, etc. My little sister is the only one that I kept the news from. She’s young… barely out of her teenage years. She is very over-dramatic. She makes any issue about HER. I can just see it if she found out: she would cry to everyone who would listen and tell them how bad her life is because her sister has cancer. I feel bad about keeping the news from her, but the thought of her making the issues about herself makes me feel even worse. I don’t know when I’ll tell her. I can understand the hesitation about telling family. Despite their best intentions, family members can add a lot of stress to the situation. Good luck with everything, Kim! My parents came for another visit today. I’m just feeling a bit down, and figured you all would understand. I continue to keep this secret from them, but have mixed feelings about it. On the one hand, I know it’s better for my sanity and day-to-day life for them not to know, as they would really freak out and micromanage every last thing I did (not just with my doctor appts but even just everything I eat, etc.) On the other hand, it just really hurts not to be able to have a “normal” parent support system. Luckily I still have my sisters to talk to about it. My older sis actually put it in an interesting way, that it’s kinda like I have to “mourn the loss of my parents” even though they’re still around, b/c they’re NOT really around when it comes to supporting me emotionally, and just can’t. Oh well. And my dad continues to refuse to see a doctor himself even though he has high blood pressure and probably gout that’s not too well controlled. Sheesh. :( Thanks again for all your support here! Glad you gave us the update. And am also glad that you have your sisters there to help you through it. It makes a lot of sense what your sister said. It sounds like the problem of them not being about to be there for you has probably been going on for ages but cancer just took a huge highlighter to it. Cancer is good for that – taking a hard situation and putting some big bright lights around it. Sorry you are dealing with this again. I did tell my parents, but wish that I hadn’t. They tried but came up incredibly short helping me in every way. No one helped me with meals during my low iodine diet, so I ate dried apricots and almonds for two weeks. All the experience left me with is guilt that I didn’t handle it as well as those I was constantly compared to by my mother. And, now, 2 years out, the slightest mention of worries about my follow ups, or noticing changes in my neck, receives the greatest scorn and comments of “you are fine, just get over it.” So, like I said – I did, but wish I didn’t. I’m so sorry for the awful position you are being put in here. It sounds very challenging on top of the horrible news of someone you love dealing (or not dealing) with a new cancer diagnosis. I’d love to say that I have complete respect for every patient’s decisions. But I don’t. Some people make bad choices. These choices are made for a variety of reasons. I don’t know why your brother-in-law is making his bad choices but I do think it is completely appropriate to intervene on his behalf. He can hate you now for trying to save his life, but my guess is that years down the line he will probably thank you. What seems less important to me is telling his parents, and more important is making sure he gets the right treatment. As I’m sure you know, testicular cancer is very treatable at stage I and can kill you at stage 4. I think it would make sense for you and others who share your concerns to try to contact a social worker or therapist either at his cancer clinic or at a local cancer center and have some kind of sit-down with you, him, and the therapist to discuss a care plan that he is willing to follow. This can sometimes be tricky because of patient privacy issues. If you want some more advice on how to pull this off, I suggest calling Cancer Care – a national non-profit organization located in NYC. They have over-the-phone counselors who can help walk you through the situation and find someone in your area who might be able to help you have a sit-down with you and your brother-in-law – a family meeting of sorts. As far as whether or not to tell his parents, that seems like something you could discuss with the therapist or social worker too. The good thing is that he is close with his parents. I too am close with mine and it just sucked beyond belief having to tell them that I had cancer. It makes so much sense to want to spare the people you love from the pain of your disease. Unfortunately, ignoring the situation does not make it go away. Sounds like your brother-in-law has a tremendous amount of fear and pain and really, really needs the people he loves seeing him through this. He might be pissed off at you for trying to take charge of this situation, but you are clearly doing so out of love and I think he will eventually see that. Go for it and don’t waste any time! In my book Everything Changes, I met and wrote about young guys who had similar responses – as though thumbing their nose at cancer would make it go away. I’m glad that I got to meet them and better understand and write about their perspectives. Some have gone on to live great healthy lives and are very thankful for the people and incidents that woke them up to the reality of what needed to be done. I also feel for you so much. Coming at it from the perspective also of someone who has told many people about my cancer diagnosis except my own parents, aunt/uncle and cousins, I can honestly say that it might truly be too hard for your brother-in-law to tell his parents himself. I think about telling my parents every time they come to visit, and I haven’t been able to do so yet. I think if I ever needed/wanted to tell them, I would actually appreciate my sisters’ help in doing it. So, I think it would make sense for you to ask your brother-in-law if it would be OK with him if you (and others) broke the news to his parents for him. As long as he isn’t vehemently opposed, then it probably would be the “right” thing to do. I think about my own situation and if I ever had a recurrence or a “bad” prognosis and whether I would tell my parents then. I think I would be scared to, for the same reason — even now, I feel like just telling them about my diagnosis (though “cured”), would make them worry incessantly, yes, perhaps even give my dad a heart attack or stroke or something. I’d also see if there may be other reasons why your brother-in-law hasn’t told his parents yet. For me, I know I will get disapproval. If/when his parents find out, I’d imagine the LAST thing he will want is disapproval that he didn’t get treatment “before it was too late.” I myself am terrified of side effects of treatment — to a fault. I can imagine that if I were faced with chemo (the usual treatment for testicular cancer), I might be more afraid of the side effects than the cancer or death itself. I know for my own thyca, I am more afraid of RAI than the risk of cancer recurrence. Thankfully, I didn’t have to refuse RAI “against medical advice,” since my cancer was caught early. Anyway, as an update, my parents came for another visit a few weeks ago. Unfortunately, I’ve had some weight gain that I can’t “hide” the way I can my neck scar. Well, my mom immediately passed judgment on that, saying I’m “unhealthy” b/c I’m not eating her home-cooked food, I left home to live on my own, etc. etc. What a surprise. Needless to say, my cancer secret continues… as does my anger and sadness each time they come to visit. I am way late to this site and I can only hope Kim that you are still with the world and recovering. I don’t know if I have cancer..yet. I am awaiting my results. What I can say is that I have kept every moment of this to myself..expect for work as I needed the time off and without explanations being given it looks like your a “bad employee” and I can’t risk losing my health insurance so my boss knows. I don’t want to share it with anyone. I dont feel like my family is in my day to day life so why should I upset their day to day life by telling them. They don’t give me attention now and I certainly wouldn’t want because I am ill. I understand why your not telling them…you don’t want the stress or the worry they will have over the news haunting you. And yes most people are selfish…they think of how it will impact them..not you. How their lives will change or how they will manage if you are terminal. How much of their time and money will they have to give. I have come to the conclusion that when I do find out ….know one will know…and if I become terminally I’ll..my thoughts will not be on how my leaving will impact them….my thoughts will only be on how peaceful Heaven is. Hi JD, I’m so sorry that you are going through the agony of waiting for test results. It is horrible and stressful. I hope you receive good news. Regardless of the results, I think it can be incredibly helpful to vent to someone about the stress of having a potential cancer diagnosis. No, it does not have to be your parents. Just someone who you trust to listen to you with empathy and without judgment. In my book Everything Changes, I interviewed a young woman named Holly who was diagnosed with cancer and hid it from everyone including her parents and husband. It was incredibly stressful and lonely for her. I don’t wish that upon anyone. There are plenty of resources out there as well for organizations that can provide good support too. Just let me know if you need any info. And yes, I’m happy to say, Kim is still with us. I still get comments from her on my blog. Jd – hope your results did not end up showing cancer, but if they did, know that we are here for you if you need it! Keep us posted. Like you, my parents are also not in my day-to-day life, and realistically, know almost nothing about my actual life – personal, career, health, or otherwise, though they may think they do. Is it bad of me to feel like I almost want to tell them just to hurt them? To let them realize that their lack of support in almost every aspect of my life, esp their blameworthy ways with regard to my health, led me to keep this secret from them? I know it would actually hurt and anger them, and at some point I think I won’t care and the truth will come spilling out. Actually, my parents came for another visit yesterday, which is why my feelings on this topic are so raw again. :P :( It’s pretty depressing for me to feel like I can’t tell my parents any of my health issues b/c they’re so unsupportive and accusatory when it comes to my “poor health.” They still know nothing about my thyroid cancer, hypoparathyroidism, adrenal nodule (recently diagnosed), muscle issues, etc., but they just notice that I’ve gained weight and claim that I’m “unhealthy” and it’s my fault for not eating my mom’s food. It’s enough to drive me insane!!! :( Sometimes I do wonder if I should try going on an antidepressant to deal with the “anxiety/depression” of all my post-cancer crap, but I really want to avoid doing so. On a day to day basis at work, I usually deal with life just fine, but visits from my parents always get me down b/c I feel like it’s depressing and hurtful not to have the “normal” support regarding all my life-changing health issues. Plus, what’s even worse is, they don’t “believe” in medication or conventional medicine. So that adds even more reason for me to keep this from them. L, if it helps you at all, I have STILL not told my parents, and it has now been over 4 years. Not saying my way is right by any means, but it is what it is. I lean on my close friends and sisters for my “support” system. Hope it all works out for you, none of this is easy. Oh wow! How are you feeling? How’s the scar? How long does it take to fade?? I just worry if there are complications; there shouldn’t be right? in the surgery? Im so paranoid. I suppose in a way it’s good as Im across the seas but I still feel dishonest and everyone’s telling me I HAVE to tell her but I dont want her to freak. She lives alone and is always worried about my brother and I, although Im nearly 40 and my brother is over that age. Anyways, thanks for your reply. Something for me to think about. Hi all! I just found this website and I’m so glad it looks like it’s still going! A year ago, I was about 8 months pregnant with my youngest daughter when my gyno said I needed to go see an oncologist urgently. So I did and he said I had leukemia. On my second follow up he said he didn’t see anything anymore. Obviously I was overjoyed at that news but at the same time I was skeptic. How do I “have” it and then all of the sudden (2-3 months later) not have it? I am wanting to go back again and get retested. My main concern is I really don’t think I want to tell my husband of the results came back to show I had anything. The first time we went through all of this, he was not very supportive and I feel like if I tell him now that he will think I’m just looking for sympathy. I honestly feel like if I tell him, he may cheat on me. I’m not sure how I would hide it but I’m glad I’m not the only person who thought about hiding a bad diagnosis from a loved one. Is it wrong to hide from your spouse though? I received a call from my older brother one night telling me that he had lost sensation to his right arm and leg. I thought he might have had a stroke, he is 49 and his career is stressful. Upon examination he was told he had stage 2 glioma of the brain. Our parents mum 90 and dad 77 have not been told, we did a overseas trip and in the last wk he got weaker. 3 months after the initial MRI and op, he had another scan which showed another mass in an area that is inoperatable. It’s been decided that it will be treated with radiotherapy and chemo. My brother lives 2hrs aeroplane ride from us. I am going through to help him. My worry is how we going to tell our parents who adore and have a soft spot for my brother. It’s killing me that I am losing my brother but I cannot bare to destroy my parents as well. lht: I really ache for what you are going through. Having to tell your parents about this sounds so incredibly difficult. I wonder if you are able to connect to a grief counselor who can give you some tips or some support as you go through this challenging time. It doesn’t matter that your brother is gown; coping with the loss of a child is awful no matter how old the parents are. I am so sorry your whole family has to go through this. Your brother is so lucky to have you in his life and there for him. Plus she stresses and worries herself right into the ER..has happened many times. She always has a weak spirit and can not take any problems or situations well at all. SHe can not handle it. Being the control freak and all that she is…I am afraid that once she understands about my brother’s Cancer…he and his wife will never have any calmness nor peace they will need in their lives anymore…nor will I. Plus I am afraid what this will do to her physically and mentally. She will mentally drain us. Instead of 1 person to take care of..there will be now 2. But, he is not doing well at all…we are not certain how longer he has to live. We are not sure how or what to tell her. I am picking up my 6 biopsies tomorrow and will find out. I can understand where you’re coming from, in fact the tumour found and the immediate medical steps i tooko was was so quick and suddenly i shared with my immediate circle of friends right away while in shock – we have chat group going as everyone lives all around the world and there’s always someone at the other end in a different timezone. I needed that support. I suppose everyone deals with it very differently, regardless of outcome of my biopsies tomorrow, i decided that I will do away with secrecy i think more people need the awareness and to take that step to get checked when in doubt. I am a very private introverted person, but I think being open about it might help others. My Asian parents are exactly the same way and would berate me and make me feel worse, rather than be supportive. My mum is like yours Kim where she will blame everything down to my lifestyle, my dad on the other hand isn’t in good health and very negative always going on and on about himself. They are quite a handful to deal with, so if I do end up having cancer, I really would rather do without the stress and me having to take care of them instead of getting some support. As it is as I deal with the agony of my biopsies results, my dad is doing his regular rageful negative rant on whatsapp. I literally feel physically ill just being on the receiving end. I am really not sure about breaking the news, and also not sure if keeping a secret is the right thing. My husband and in laws are really supportive. I don’t have a network of friends here where I live and if I need treatment depending on tomorrow’s biopsies results, I will probably head home where I have a bigger support system. In any case, I’ll wait for my results tomorrow. 2.4cm tumour in left breast with reactive auxillary lymph nodes and had 6 biopsies done. My daughter was extremely close to her dad, stepmother and stepsister her whole life until a family cotrastophe tore that relationship apart.For the last 2 years my daughter has had no contact with her dad. ( He chose not to believe my daughter’s side of the story. Now she has been diagnosed with cancer and refuses to tell her father. She feels she has enough to handle with the cancer and her own husband and children to deal with her dad. This makes me so sad for her and my ex. but I will follow her wishes. I have just been diagnosed with breast cancer and my mum can not handle stress, she told me once, when I went to tell her about my son, not to tell her because she doesnt need the stress. For this reason I have decided not to mention the c word, unless I have to later on, if and when i have to have chemo as I would not be able to hide its effects from her as we lost my dad from it.I am just going to tell her I need a lump taken out as the doctor thinks it is advisable, and then play it by ear. I would not be able to cope if I told her and she got sick because of it-she never has been the strong type.I totally beleive this is for the best, as I could not handle my illness and worry about her as well.